Not long after his confirmation, EPA Administrator Scott Pruitt agreed to speak to the Association of Clean Water Administrators — if reporters were barred from the meeting. "Could you please confirm that this is a closed press event?" wrote Millan Hupp, Pruitt's former scheduler. Organizers told them not to worry. "If the press should appear, we'll take appropriate action," wrote Annette Ivey, the group's director of operations. Limited press access, friendly conversations and audiences that welcome conservatives are a few of the perks that industry groups and some media organizations offered Pruitt in return for speaking to them, according to a trove of emails recently released under the Freedom of Information Act. 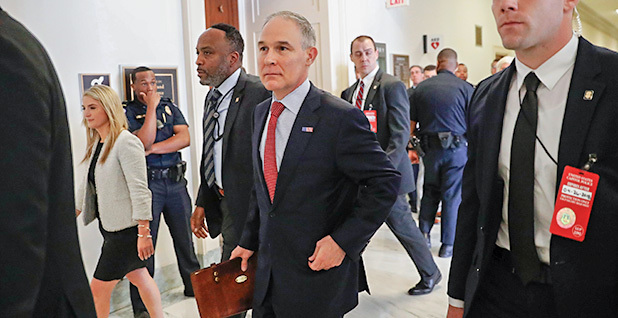 The thousands of documents, released after the Sierra Club filed a lawsuit to get them, reveal behind-the-scenes negotiations with EPA staff as outside groups tried to lure Pruitt for interviews, speeches and other appearances. The email conversations are the latest examples of Pruitt and his team steering the EPA chief toward groups and press outlets that they deem "friendly." As Pruitt was preparing for a trip to Iowa in November, the communications director for the Iowa Association of Electric Cooperatives emailed EPA press secretary Kelsi Daniell to ask for an interview with the industry group's magazine. Erin Campbell of the Iowa industry group sent along five questions they wanted to ask and said, "Let me know if any of these give you heartburn. This would be a friendly interview environment and we're keeping the conversation focused on Iowa consumers." Campbell said EPA could review the article before it went to print. The pitch worked. An exclusive interview with Pruitt appeared in the Living With Energy in Iowa industry magazine. The emails also show that keeping press away from Pruitt is a priority and that aides screen for "unfriendly" outlets. In one email, Pruitt's aides invite a local Fox News television station approved by the White House to an October event for the Tennessee Farm Bureau. "FYI our comms team has invited Fox 17 to cover and interview Administrator Pruitt after the event. Kevin — would that be an issue for y'all? The White House recommended," wrote Tate Bennett, deputy associate administrator of EPA's Office of Congressional and Intergovernmental Relations. A constant thread in the emails is Hupp, Pruitt's former scheduler, reiterating to event planners the need for closed press. There are requests to tell reporters about an event after it's over and for keeping the administrator's name off promotional materials. For example, after Pruitt was scheduled to speak at a Federalist Society event in Florida in February, his aides wrote that his participation should not be publicized. "One item in particular we'll be looking for information on is how this event will be advertised," wrote Hayley Ford, a Pruitt aide. "We would appreciate the Administrator's name not being included on any materials until we have this conversation." In other emails, right-leaning media outlets promise soft coverage and play up Pruitt's record on rolling back regulations to score interviews. One conservative radio host offered to let Pruitt talk about anything he wanted. If Pruitt appeared on New York businessman John Catsimatidis' talk radio show, the EPA boss could "talk about anything he would like, most recently coal," wrote Matt Wanning of Red Apple Group, the businessman's real estate and aviation company. A Breitbart News reporter said he planned to ask Pruitt about common conservative talking points. Charlie Spiering, Breitbart's White House correspondent, said he wanted to discuss "rolling back some of the overreaching regulations and fighting the special green interest groups." Spiering scored a sit-down interview with Pruitt in Breitbart's offices. The resulting story was a flattering look at an EPA boss who promised to bring "originalism" and "regulatory certainty" to an agency that he felt had "lost its way in the Obama years." Last August, the Washington Examiner's editorial director, Hugo Gurdon, wanted Pruitt to do an exclusive interview with his paper, followed by a keynote speech at an energy and environment event. "Washington Examiner is an ideal platform for the discussion of conservative policy ideas, as we have millions of readers willing to give Republican and conservative politicians a fair and sympathetic hearing," Gurdon wrote to Pruitt's chief of staff, Ryan Jackson. The Examiner got the interview and published a number of stories, Gurdon told E&E News yesterday. That included this story titled, "Scott Pruitt criticizes Obama as 'environmental savior,' moves EPA away from climate change." The emails also show that Pruitt prefers a gentle touch at luncheons, with a "fireside chat" format where moderators from conservative think tanks ask him preapproved questions. Before his talk at the Iowa electric co-op event, an organizer reached out with some specific questions, including "Does the Clean Air Act give the EPA the authority to regulate carbon emitted from electric generation facilities?" Bennett, the deputy associate administrator of EPA's Office of Congressional and Intergovernmental Relations, quickly rejected the questions. "No — if they want to talk to him about these before hand, that's fine. Way too specific for a fireside chat. Sorry," she wrote. When Pruitt traveled to a Texas Earth Day event in April 2017, a mock-up of the schedule that required the administrator to be on stage shows "questions prepared and agreed beforehand." Before Michigan Farm Bureau President Carl Bednarski introduced Pruitt at a November event, his comments were sent to EPA for preapproval. They included a request to tell the audience not to shoot videos or take photos "as a show of respect to our special guest." The emails also offer a glimpse into how EPA staff members deal with press coverage they don't like. In May 2017, just before President Trump announced his plans to pull the United States out of the Paris climate accord, Axios reporter Amy Harder reached out to Jackson, Pruitt's chief of staff, about a story she was writing. "We're hearing some stuff about the Paris deal, in particular how Administrator Pruitt has been involved, and we're hearing President Trump is looking to decide this week to withdraw from it," Harder wrote. Later that day, she sent Jackson a link to the story, co-written with reporter Jonathan Swan. They reported that Pruitt had been telling aides he wanted them to limit their public lobbying for a withdrawal from Paris and that the White House told Pruitt to lay off TV appearances until Trump announced his decision. Jackson wasn't pleased. He wrote to Harder, "Nice rumor mill hatchet job. Don't contact me again." Jackson didn't respond to a request for comment about the exchange. The emails also show how EPA staff and Andrew Wheeler — then Trump's nominee for deputy administrator — responded to coverage of Wheeler's past criticisms of Trump. Wheeler had said of Trump, "no one really knows what his political beliefs are," he "doesn't understand how the government works" and "he is a bully." Jackson strategized about a response with Wheeler and then-communications aide Liz Bowman. "Andy, this was when you were supporting [Republican Florida Sen. Marco] Rubio but you changed your support to legitimately favor Trump," Jackson wrote. "What can we say further on this?" Wheeler, who's now EPA's deputy administrator, wrote that he had later gone to hear Trump speak at a rally, where he gave "the most comprehensive energy speech I had ever heard from a Presidential candidate. I learned quickly that the press had been misrepresenting his views and campaign." In a later email, Wheeler apologized to Jackson and Bowman that "this has become an issue." Bowman replied, "Oh gosh, don't apologize. This is the smallest fire we will put out all day." Reporters Corbin Hiar, Mike Soraghan and Ariel Wittenberg contributed.